How much fun was or wasn't CALIcon14? We want to know. We've got a short survey for you to fill out. Just visit http://cca.li/tE and fill it out. WCC is Harvard's designation for Wasserstein Hall, the site of CALIcon14. WCC is part of the Harvard Law School campus and is located along Massachusetts Ave. CALIcon14 sessions are being held on the 2nd and 3rd floors of WCC, with other events located thoughout the building. Just 36 days until legal education and technology’s premiere educational and networking event…CALIcon14! And with that date drawing closer, I have some updates for you. Bring your computers! We will be installing Virtualbox, which is very good desktop virtualization software and once we have that installed, we will install Linux Mint. This hands-on workshop is in room WCC 3008. It consists of 3 one hour segments on Thursday afternoon from 1PM - 5PM that follow the session and break schedlue of the conference. Because seating is limited to 20 CALIcon14 attendees you need to signup to reserve a seat. This workshop is only available to CALIcon14 attendees and there is no extra cost. [CALIcon14 Presenters] Presenter Notes: Less than 3 Weeks Until CALIcon14! Are you ready for a great CALIcon14? 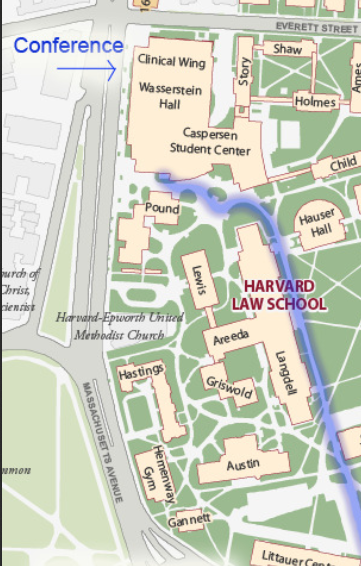 In less than 3 weeks we'll be gathering at Harvard Law School for the 24th Annual CALI Conference for Law School Computing and you are going to make it great. As we get close to CALIcon14 I have some notes for you. You are receiving this because you are listed as a presenter at the 24th Annual Conference for Law School Computing to be held June 19-21, 2014 at Harvard Law School, Cambridge MA. This message is long but it contains important information. Please read the whole thing. THANK YOU for volunteering to be a presenter. The time and effort you put into your presentations is very much appreciated by myself and your colleagues. Your presentations are a huge part of what makes CALIcon such a great conference. This page contains information for presenters at the 2014 CALI Conference for Law School Computing (CALIcon) held at Harvard Law School, Cambridge MA, June 19 - 21, 2014. All presenters should review the information on this page and contact Elmer if you have any questions. Here is the basic conference program and timings for travel planning. Please check the list of sessions for specific session information. A preliminary agenda will be available in mid May. Food: Pizza and Drinks provided.